Visiting a family dentist in Arlington has numerous advantages. You can save time because you’re not running all over town to visit different practices; you only have to keep track of one office’s payment policies; and your dentist can look for any inherited issues that might affect your oral health or that of your family members. But how can you find an oral healthcare professional who is a good fit for both you and your kids? We think that, after you learn more about Dr. James Gray and our team, you’ll be eager to give us a try as your family’s dental practice. When you’re searching for a dentist for yourself, you should consider the current state of your oral health. If your teeth and gums are in fairly good shape, you might just be looking for someone who has a reputation for being gentle, thorough, and kind. On the other hand, if you have special oral health concerns, or if you’re looking for certain services, it’s important to dig a little deeper into a dentist’s qualifications. A practice’s website usually has detailed information about the dentist’s education and the procedures they’re able to perform. Dr. James Gray is a general dentist with more than 30 years of experience. In addition to performing all of the basic procedures you would expect from an oral healthcare professional, he offers some specialty services that you may not be able to find at other practices. For example, he has completed extensive training in dental sleep medicine. He is also a certified Invisalign provider and offers a number of cosmetic procedures as well. Convenience and financial options are also important to think about. Dr. Gray offers early and late appointments to accommodate the busy lifestyles of his patients. Our team is also happy to accept payment from most types of dental insurance. For patients without insurance or who need major services, we can help to arrange affordable financing through CareCredit. Kids might be a little squirmy or nervous when they visit a dentist, so you should focus on finding someone who is patient and gentle. This is especially key if your child has emotional or behavioral issues that make it difficult for them to sit still for extended periods of time. Our entire team loves to work with patients of all ages and backgrounds. If you would like to learn if our practice is a fit for your child, you can check out our online reviews to see what other parents have had to say about how we interact with young ones. You’re also welcome to stop by our office to see if the environment is somewhere you think your child would be comfortable. Bear in mind as well that the oral health needs of children are different from that of adults. For example, since children are so prone to munch on sugary foods, they might need extra help to learn how to make good snack choices. They might also require extra coaching on how to brush and floss properly. 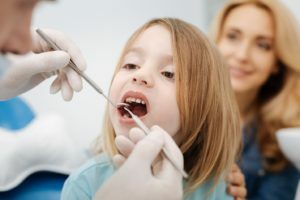 A patient and kind dentist like Dr. Gray, who is good at explaining oral health concepts to young minds, can go a long way toward motivating your young ones to adopt smile-friendly habits. You shouldn’t have to run all over town for your family to get the high-quality oral healthcare it deserves. Search for a dentist who is able to provide gentle, friendly, and skilled care to both you and your children. Dr. James T. Gray is an experienced and kind dentist who enjoys working with patients of all ages. He offers a robust range of services, and our office has early and evening appointments available to accommodate busy family schedules. To learn more about Dr. Gray or to schedule your next visit with us, contact us at 817-460-4131.